Gentle Yoga is twofold. It’s geared towards those looking for a light yoga practice as well as new students who need a strong foundation with focus on the poses, in depth descriptions, adjustments & explanations. Seasoned or unsure, you’re sure to unwind. Yoga Flow will focus more on incorporating Ujjayi Breath work along with the concept of flow, either Vinyasa or Hatha. This class will increase your body temperature and your heart rate, as well as take you deeper into yoga poses and variations. Bring your little one! This class will look at exercising your baby as well as yourself! Focused on baby stretches, Barre work and Yoga, bring Baby, a blanket, carrier and toy. Use the additional weight of your LO to safely increase your stregth & flexibility! These classes are designed for 14-18 year olds who would like a head start on learning to dance for their Quinceañera or Prom. We’ll cover traditional dances such as Waltz & Foxtrot, as well as contemporary dances such as salsa, merengue, swing, & cha cha! These classes are excellent, whether you’re planning a wedding, attending a wedding or company Christmas party or just looking for something fun! 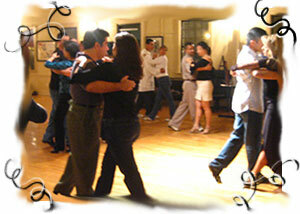 We’ll look at the 8 major dances: Foxtrot, Waltz, Tango, Salsa, Cha Cha, Swing, Rumba and Two Step. Semi-Private lessons are scheduled at your convenience. You find people you want to dance with or practice Yoga with, you bring along your friends, maybe a bottle of wine and call me to set up a time! Pricing depends on the number of people involved, the larger the group, the cheaper the cost per person. Semi-Private classes are an inexpensive and relaxed way to begin your journey. Typically used to supplement Private lessons, or to gain more individual attention, these classes, in dance, will introduce steps, techniques, and style as well as frame and partnership, and in yoga, will concentrate on specific alignment, getting deeper into the poses and focusing on problem areas. Some practitioners will progress very well through Semi-Private Classes, finding time to practice and use what they learn. Many students however, find that they progress more smoothly and quickly with additional help through one on one (or two!) instruction. This course will introduce the basic patterns of the eight major dances. Whilst becoming comfortable with moving around the floor with our partners, and with music, we will also begin to work on Frame and Partnership including Leading and Following. This course will review the basic patterns of the eight major dances, whilst adding more intricate steps. We will also focus more on connection through the frame, styling the individual dances and beginning technique. This course will focus on two dances per month, reviewing and polishing previous steps whilst adding more complex patterns. We will work in depth on Footwork, Dance Position, Alignment, Body Contact and Latin technique. We are hoping to hold our first dance social on Friday December 15th! Stay tuned for more information!